YEREVAN—The Republican Party of Armenia on Wednesday signaled its support for Nikol Pashinyan a day after the party rejected his candidacy during a parliamentary vote to elect a new prime minister. The apparent—and dramatic—about face was announced on Wednesday night when the Republican Party of Armenia’s parliamentary faction said that it will not nominate a candidate for the post and will “help” a candidate that enjoys the support of at least one-third of lawmakers, become prime minister. 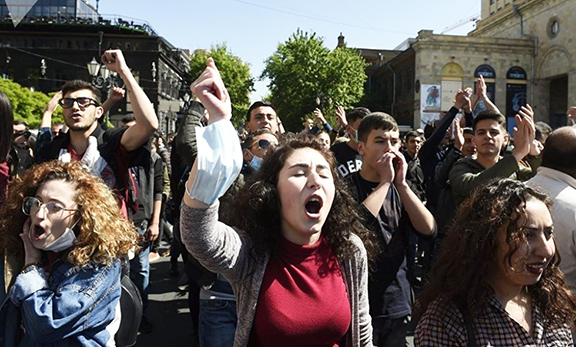 The announcement, made by the party’s parliamentary faction chairman Vahram Baghdasaryan, followed a meeting between Republican lawmakers and former prime minister Serzh Sarkisian, who resigned last week as public pressure mounted through the Pashinyan-led protests that started on April 13. On Tuesday, when parliament convened to elect Pashinyan, who was the sole candidate for prime minister, the Republican Party of Armenia rejected his candidacy and all but one of its lawmakers voted against Pashinyan, thus hindering the election of a prime minister. Earlier on Wednesday, businessman Gagik Tsarukyan said his faction, with 31 votes, will support Pashinyan as it did Tuesday. The Armenian Revolutionary Federation and the Yelk alliance, which hold seven and nine votes respectively have also pledged to support Pashinyan, whose election seems a to be guaranteed given the Republican Party of Armenia’s decision. Putin must have woken up on the right side of the bed this morning. About face decisions can only come from the top boss. Please tell us what is going on in Armenia. Who should we support? MSM doesn’t give us any information or background. Congratulations, you have made a wise decision. Thank you ..
ARMENIA is always unic!! We all must be pride of our Armenity and Armenia the unic countrey in the world where all the citizens ,rigth or left, reach or pover, yong or old, honest or mafios when nedded are all toghether to solve FIRST! Armenia Interests. I just don’t understand. Where is the popular vote? Did the mob in the streets intimidate the legislators into choosing Mr. Passhinian for the position? Is the new constitution provide for street mob nomination process? I’m used to the American system; Simple, predictable and transparrent. Well, sort off. Any Goverment that goes against the will of it’s People, can never stay in power. Sooner or later it will collapse. History is the evidence.